I love months that make it easy for me to create fun, thematic activities and February is one of those months! For this math activity, you have to go no farther than the candy aisle in your grocery or department store. 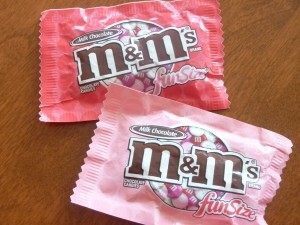 I found these small packages of Valentine M&M’s and had several ideas for how I was going to use them. I love this little package because it has several colors which makes it really easy to sort while also helping with randomness because each package will have different amounts. I took a sheet of paper, drew some hearts and wrote one color word inside each heart. 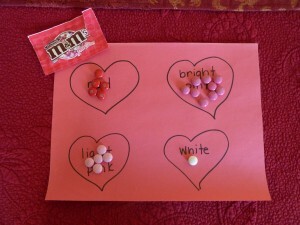 When the package is opened, we pour the candy out and sort the M&M’s by color, placing them inside of the heart with the correct color word. Once the candy is sorted, we count and write the amount on a Post-It Note. I typed and printed some questions to work on math skills (counting and analyzing data), math vocabulary (least, most/greatest, same/equal) and also paying attention to what he’s done in order to answer questions. Which color is your favorite? Why? Do you like the way they taste? After the activity is done, they can eat their math manipulatives and my guess is that they will look forward to doing this activity again! !